Springback Manuscript Binders: the writer’s old-time favorite! Ideal for poets, actors, writers, scripts, theses, law briefs and so much more. At the request of writers who work in long forms, we now offer three sizes. Sheet counts above are conservative and refer to a paper weight of 20lb/75g (standard everyday use copy paper). Inserting more sheets or thicker sheets may make for less grip from the spine. Remember when you were an undergrad, and all the visiting writers read out of those cool black notebooks that looked like hardback books? We’ve located a supplier and are now offering them for sale in 3 sizes. These hold 8.5 x 11″ paper (US standard letter size). This is its baby brother, the binder clip that is so popular now. The entire spine of this binder is a steel spring clip (the big brother of those “bulldog” binder clips everyone uses nowadays for papers.) You could think of it as a high tension spine clamp. The boards and spine are covered with black leatherette, good for years of use. To insert pages into a springback binder, you bend back the covers until they almost touch and the high tension spine clamp opens. 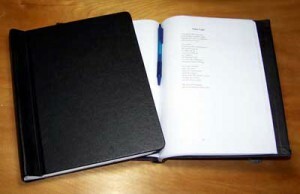 The binder comes with a black tagboard folder to hold your pages. You just insert the folder with the pages (or the pages alone) and return the cover to the “closed” position. If you cannot see the video click here! These are also used as thesis binders, script binders and even stamp albums. Great for lawyers, too, for trial papers, estate plans, etc.! Our springback binders are seen on sets like “Dumb and Dumberer”, “Community”, Legendary Pictures and in the hands of actors and writers everywhere. Payment via PayPal Money button above or you can call us with your credit card. Shipping within the US is $12 for the first binder, $1.50 each additional, including mixed sizes. This is the shipping charge for our standard leatherette binders only – shipping for custom leather binders varies. Please query us. For International Orders, bulk orders, help with calculations or help with other questions, please send email to jbkerman@mayapplepress.com. Once we have established the correct amount, we will send you a PayPal Payment Request by email, or you can send a check. Please do not use the PayPal buttons for bulk, custom leather or international orders.